Oranges are high in Vitamin C but they are not the most Vitamin C rich food on our list! 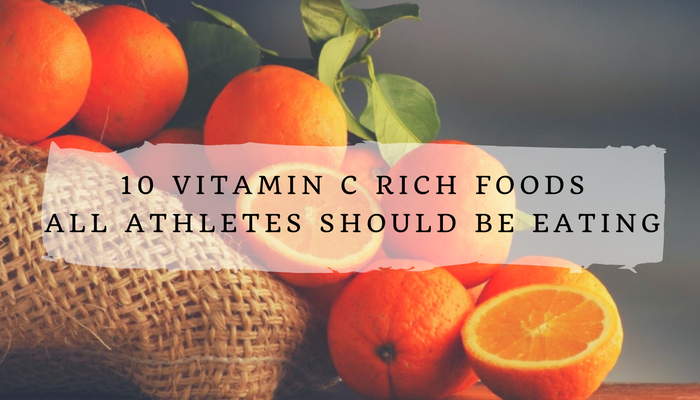 Oranges– We start with the most common food when people think about about Vitamin C. But did you know that it is actually not the most Vitamin C rich fruit or vegetable on our list? 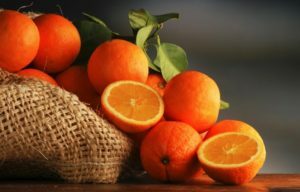 A medium sized orange contains 85% of your daily value of immune system boosting Vitamin C. Oranges can be eaten by themselves as a great low-calorie snack, or added to other foods such as salads. Oranges also are one of the least expensive and most readily available foods on our list. A single cup of red bell peppers contain over 300% the vitamin C of the same amount of oranges. 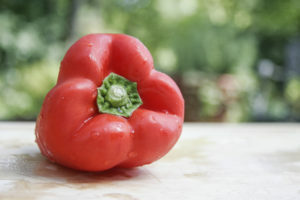 Red Bell Peppers– Most people think about the green variety when you mention bell peppers but it is actually their red cousins that contain the most Vitamin C of bell peppers. A single cup of Red Bell peppers contain over 300% the Vitamin C of the same amount of oranges, and over 200% of your daily. They also contain many antioxidants and make a great addition to any salad, stir fry or as an easy on the go snack. Kale– The super food that has been all the rage of the foodie seen for years, Kale is one of the best foods when it comes to immune health. In addition to its many health benefits and Vitamin K, a single cup of Kale contains over 134% of your daily value of Vitamin C. Whether it be a Kale Salad or kale chips you should definitely consider adding Kale to your weekly diet. Brussel Sprouts– This small vegetable gets a bad wrap for being bitter. When properly prepared it not only tastes great, it contains many great nutrients. They are a good source of protein, iron, and cramp preventing potassium. ½ cup of cooked Brussel sprouts contain 80% of your daily value of Vitamin C.
Broccoli is high in Vitamin B1, B6, E and contains over 107% of your DV of Vitamin C in a half cup (cooked) serving. Broccoli– Mom always said to finish all your broccoli! And she was right! To start, broccoli is one of the most nutrient rich foods out there. Broccoli is rich in dietary fiber, vitamins B6, E, B1 and A as well as potassium and manganese. 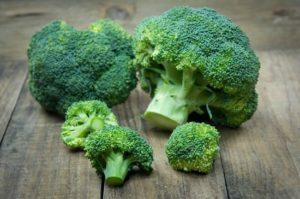 To top it off, just half a cup of cooked broccoli contains 107% of your daily value of Vitamin C! Broccoli is also one of the most versatile foods out there; it can be used in everything from stir-frys, to pizza, to salads. It can even be eaten raw as part of a vegetable platter. Strawberries– For athletes who are constantly breaking down their body, antioxidants are very important. Strawberries not only are rich in Vitamin C (1 cup=140% of the recommended daily value) they contain many antioxidants. So whether you like them raw, on salads or thrown in your favorite protein shake, make sure to include plenty of strawberries in your diet! Grapefruit– Grapefruits are often avoided by many athletes because they are more bitter than oranges and tangerines, however, sprinkle a little stevia or truvia on them and they taste great! They have been shown to boost your metabolism, help with kidney health and improve digestive health. A cup of grapefruit (approximately 1 large grapefruit) contains around 142% of your daily value of Vitamin C.
A single small guava fruit contains more than 100% your daily value of Vitamin C! 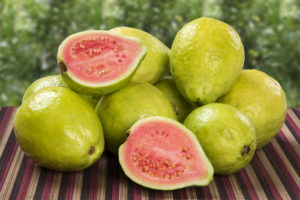 Guava– Once a hard to find fruit, Guava has now become more common in grocery stores all around the country. Guava is rich in manganese which helps the body absorb more nutrients from the foods we eat. They also contain almost as much potassium as bananas and have been shown to help with your skin health. Given the abuse from sweat and grime that many athletes skin and face take we’re sure many could benefit from some Guava! In addition to these benefits, Guava’s immune system boosting qualities can’t be denied with over 100% of your daily value of Vitamin C in a single small Guava fruit! Kiwi– Kiwi’s have been called one of the worlds healthiets foods. Low in calories and high in many vitamins including 31% of your daily vitamin K and 85% of your DV of Vitamin C in a single small Kiwi, its easy to see why. They make great additions to fruit salads or a few make a great snack. Tomatoes– We finish our list with one of the most versatile foods on the planet. Used in everything from salads, to sauces, to on top of burgers and sandwiches. From their antioxidants, to their fiber, to their Vitamin C they are also one of the healthiest foods out there. Even though a large tomato only contains 33% of your daily recommended value of Vitamin C it makes our list because of its versatility. There is no excuse not to be adding some tomato to your diet almost every day.